Includes both original 6 cylinder engines, plus a spare engine. All parts and trim are available and included. 3 axle trailer is included. Title reads as a 1958, 31 footer. Manufacturers inspection record describes it as a 1956 33 Foot Futura Model that sleeps 4. Inspection record paperwork (shown in photos) and 1956 ad flyer (partially shown in photos) are included. 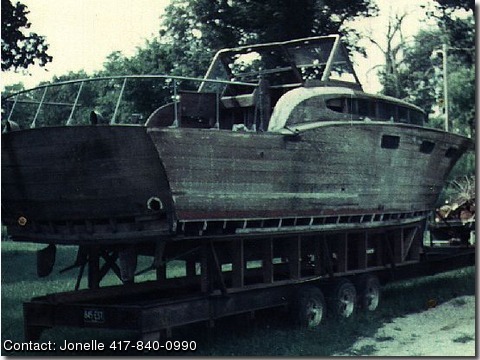 Boat has been stored in barn since 1987. There was never time for the anticipated restoration. Electrical is original 6 volt system that will need to be converted. Price is based on pickup in Ozark, Missouri. Buyer is responsible for all freight and shipping costs.